I was never totally clear on what that meant, but the gist of it went something like this: People who are on Facebook are already primed to think in social terms; they’re already online thinking about their friends, their connections, wanting to find out what’s happening in other people’s lives, and so on. 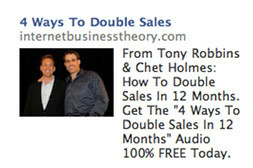 You want your ads to tap into that mindset rather than disrupting it. And this makes a certain amount of sense, right? This is one of the reasons trivia quizzes that allowed you to share and compare your results with friends worked so well on the Facebook platform. So the idea was that ads would do better if they were social. Still, it’s an interesting thought, isn’t it? How do you make an ad social? Now, the first option has been popular almost since day one of Facebook advertising; ads leverage our social natures whenever they use images of faces, because we are hardwired to both pick out faces from background visual clutter, even to the point of seeing them where they don’t really exist — man in the moon, anyone? We pay attention to faces, especially pretty, female faces, so ads use them a lot. See the pattern? Pictures of two people conversing, hugging, smiling, etc. I especially like the ad for Rosetta Stone, because the context of the picture involves an intriguing and interesting story. You can guess these two are on vacation in a foreign land, having fun at the train station, and then the picture and the headline work together to make learning a new language a very appealing prospect. The bottom ad showing Dr. Oz talking to a woman also works well, since the image not only depicts a social situation involving those two, but a televised social situation that both involves the viewer and helps to borrow some of Dr. Oz’s celebrity doctor credibility for the advertised diet plan or product. The middle ad probably isn’t as good — clearly the ad shows two guys because they’re both headlining the advertised product — but the ads use of showing the two guys “hugging,” rather than power-posing from the stadium, makes it a pretty good example of how the image technique in question is growing more popular. 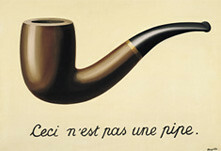 Of course, showing social interaction doesn’t exactly make an ad social, just like the image of a pipe isn’t a pipe. I suppose the next step would be to make the ad itself social, or at least to make the “click” a social act, which is exactly the point of “likes” and ads linking to Facebook Fan pages, isn’t it? Turns out those Facebook guys gave us some pretty solid advice after all!